Nestled between scenic prairies and wooded mountains outside of Coeur d'Alene in Idaho, Ida-Home Bed and Breakfast is a charming inn with comfortable accommodations and year-round activities ranging from swimming, fishing, and river-rafting on Lake Coeur d’Alene to hiking, mountain biking, and rock climbing. The elegant retreat boasts four well-appointed guestrooms with country-style décor and period antiques, sitting areas with wardrobes and armchairs, and modern amenities, and one shared bathroom with a shower and double vanity. A complimentary breakfast is served every morning, and select additions for guests include hot tubs, massage services, fresh flowers, welcome packages, and signature bathrobes. Ida-Home Bed and Breakfast is a few miles away from the Spokane River and a short drive from the Coeur d'Alene Lake, which offers an array of activities for the whole family. Ida-Home Bed and Breakfast features four well-appointed guestrooms with country-style décor and period antiques, sitting areas with wardrobes and armchairs, and modern amenities. All guest rooms have king or queen-size beds dressed in Comphy sheets, luxury linens, and thick pillows, and a shared bathroom with a walk-in shower, double vanity, signature bathrobes and slippers, and deluxe bath products. Sitting areas have armchairs, sofas, antique wardrobes, and fireplaces, and modern amenities and rooms have large windows or glass doors with lovely views. The Heritage Room has a king-size bed with a pillow-top mattress, Comphy sheets, luxury linens, and thick pillows, two reclining chairs, a working fireplace, and a shared or private bathroom with a walk-in shower, double vanity, signature bathrobes and slippers, and deluxe bath products. The Dogwood Room opens onto a private patio with a table and chairs, terraced gardens and a firepit, and features a coffee table and chairs, a love seat, an in-room sink, mini-fridge, and a shared or private bathroom with a walk-in shower, double vanity, signature bathrobes and slippers, and deluxe bath products. The Harrison Fisher Room offers a queen-size bed with a pillow-top mattress, Comphy sheets, luxury linens, and thick pillows, a loveseat and a shared or private bathroom with a walk-in shower, double vanity, signature bathrobes and slippers, and deluxe bath products. This room opens onto a private patio with a table and chairs, terraced gardens and a firepit. The Rock Room is a cozy room with a single bed, a pillow-top mattress, Comphy sheets, luxury linens, and thick pillows, an antique rocker, and a shared or private bathroom with a walk-in shower, double vanity, signature bathrobes and slippers, and deluxe bath products. 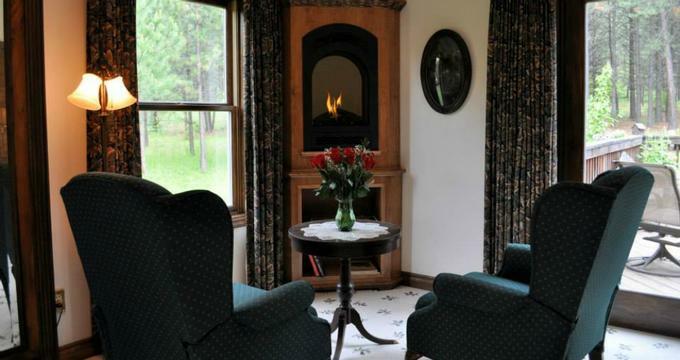 Deluxe amenities at the Ida-Home Bed and Breakfast include terraced gardens, a hot tub and a firepit, a complimentary breakfast every morning, and free high-speed wireless Internet around the property. Additional specialties for guests include fresh flowers, in-house massages and spa services, welcome packages of crackers, cheese and cider, fresh homemade soaps, signature slippers and bathrobes, and gift certificates. Situated on the banks of the Spokane River and surrounded by majestic mountains and vibrant evergreen forests of ponderosa pine trees, the town of Post Falls, Idaho is an authentic mill town with spectacular natural beauty and a rich heritage. Named after a German immigrant called Frederick Post, the small town offers much to see and do in the way of activities and attractions, as well as plenty of restaurants, cafés, bars, and shops. Year-round activities range from swimming, fishing, and river-rafting on Lake Coeur d’Alene to hiking, mountain biking, and rock climbing.